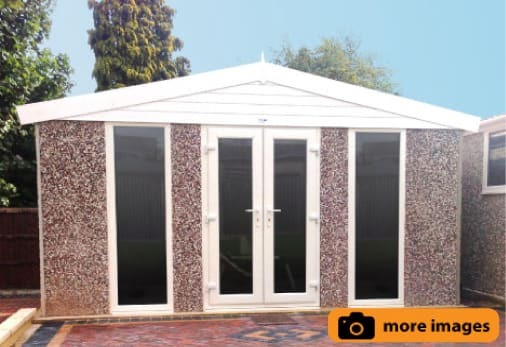 A superior range of buildings at an affordable price, with many different uses from home offices, garden rooms, beauty salons and much more. 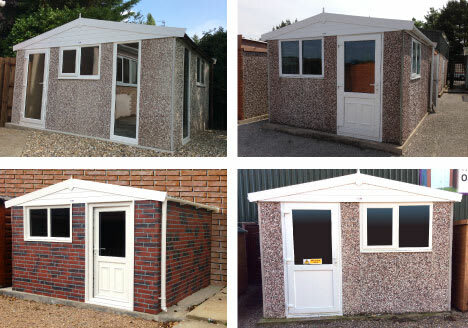 Great for Home Offices and Garden Rooms, The Garden Building Range is our latest addition to our product range – The Garden Building Range can be supplied with a Pent or Apex roof, with a large range of custom options such as full height windows. Suitable for a wide range of uses from Garden Room, Home Office, Beauty Room, Studio, Music Room, Home Gym and much more. 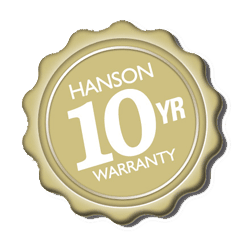 As standard our Garden Building Range features maintenance free white PVCu fascias and guttering, our attractive multi-spar finish and a 10 Year Structural Guarantee. A wide range of window and door options are available, along with many different roofing options such as our 40mm insulated roof which is recommended for this type of building. Standard height is our usual 6’6” but extra height is available. All PVCu doors are white as standard. Upgrades to other colours and our popular wood effect (Golden Oak and Rosewood) are available. All Hormann Steel personnel doors come in white as standard. Other colours are available as additional extras. A wide range of window options is available including our popular 2′ full height PVCu windows. PVCu windows are available in 2’ and 4’ widths, standard and full height, which can be opening or fixed. Choose one or more of the following windows to match your garage. We provide a wide range of roofing options for your new Garden Building. If your chosen building is a Pent (Rearward sloping roof) it comes as standard with a galvanised steel roof with anti-condensation felt underlay. If your building is an Apex roof, cement fibre roof sheets are supplied as standard. Our roof sheets are strong, robust and hard wearing, with an excellent resistance to condensation. Choose from the range of colours opposite to perfectly match your garage to your home. Alternatively, supply your own bricks and we will create a unique matching look. Under certain circumstances it may be possible to supply a broader range. Brick frontage is only available on the front of buildings. If you require brick around the whole building, we offer brick cladding which would be suitable. UNIQUE PANEL DESIGN – cleverly designed overlapping panel joints give a weatherproof seal and sealed with mastic internally. Fitted with market leading doors, pre framed to ensure ease of use.